The Gothic builders sought to reflect in the visible structures of their cathedrals the unseen world of spirit. When we enter a Gothic cathedral, we sense that every visible component has a job to do; the architects achieved a unity of form and function that has seldom, if ever, been surpassed. Something similar is afoot in the computer images of DNA. Here too we have visible expression to invisible realities. Here too is an almost mystical vision of a hidden harmony established throughout the cosmos — the unsuppressible capacity of substance to generate self. This stunning isomorphism, while almost certainly unintentional, is no coincidence. 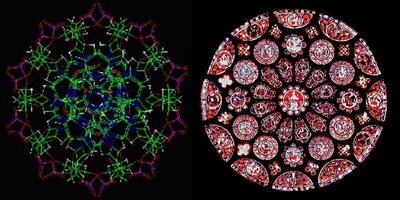 Rather it is the natural result of the fact that DNA and the human consciousness that conceived of the rose window as an exquisite manifestation of the “beautiful and sublime” are made of the same elusive stuff. Our survival as organisms depends on highly evolved immune systems that constantly make value distinctions between self and non-self with no reliance on our conscious awareness. Wouldn’t it be a stretch, then, to assume that our aesthetic systems are not founded on similar evolutionary mechanisms? Unseen forces of spirit, indeed! ~ by emilypothast on November 5, 2008. I would like to know more about this!